If constant stress has you feeling disillusioned, helpless, and completely worn out, you may be suffering from burnout. When you’re burned out, problems seem insurmountable, everything looks bleak, and it’s difficult to muster up the energy to care—let alone do something about your situation. The unhappiness and detachment burnout causes can threaten your job, your relationships, and your health. But burnout can be healed. You can regain your balance by reassessing priorities, making time for yourself, and seeking support. In many cases, burnout stems from your job. But anyone who feels overworked and undervalued is at risk for burnout—from the hardworking office worker who hasn’t had a vacation or a raise in two years to the frazzled stay-at-home mom struggling with the heavy responsibility of taking care of three kids, the housework, and her aging father. Start the day with a relaxing ritual. Rather than jumping out of bed as soon as you wake up, spend at least fifteen minutes meditating, writing in your journal, doing gentle stretches, or reading something that inspires you. Adopt healthy eating, exercising, and sleeping habits. When you eat right, engage in regular physical activity, and get plenty of rest, you have the energy and resilience to deal with life’s hassles and demands. Learn how to manage stress. When you’re on the road to burnout, you may feel helpless. But you have a lot more control over stress than you may think. 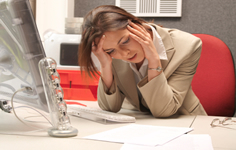 Learning how to manage stress can help you regain your balance. Sometimes it’s too late to prevent burnout—you’re already past the breaking point. If that’s the case, it’s important to take your burnout very seriously. Trying to push through the exhaustion and continue as you have been will only cause further emotional and physical damage. While the tips for preventing burnout are still helpful at this stage, recovery requires additional steps. When you’re burned out, the natural tendency is to protect what little energy you have left by isolating yourself. But your friends and family are more important than ever during difficult times. Turn to your loved ones for support. Simply sharing your feelings with another person can relieve some of the stress. The other person doesn’t have to ret to “fix” your problems; he or she just has to be a good listener. Opening up won’t make you a burden to others. In fact, most friends will be flattered that you trust them enough to confide in them, and it will only strengthen your friendship. The most effective way to combat job burnout is to quit doing what you’re doing and do something else, whether that means changing jobs or changing careers. But if that isn’t an option for you, there are still things you can do to improve your situation, or at least your state of mind. Actively address problems. Take a proactive rather than a passive approach to issues in your workplace, including stress at work. You’ll feel less helpless if you assert yourself and express your needs. If you don’t have the authority or resources to solve the problem, talk to a superior. Clarify your job description. Ask your boss for an updated description of your job duties and responsibilities. Point out things you’re expected to do that are not part of your job description and gain a little leverage by showing that you’ve been putting in work over and above the parameters of your job. This article was originally posted on helpguide.org. ©Helpguide.org. All rights reserved. Helpguide.org is an ad-free non-profit resource for supporting better mental health and lifestyle choices for adults and children.